The World Cup 2018 is almost upon us and with it will come one of the most high-tech recordings of the beautiful game ever. That means FIFA will be filming all the action in 4K and HDR quality. All good for the eyes, but what about the ears? A 4K and HDR TV is great, sure, but people often overlook the audio. With TVs as slim as they are these days the sound quality can often be lacking. One of the best parts of a football game is the atmosphere. A great way to recreate that at home is with a decent sound system. FIFA has described the recording of games as offering “immersive audio”. How that is then broadcast is another matter. Since ITV and the BBC will be airing the games they may end up being limited. ITV doesn’t broadcast in 5.1 surround sound and the BBC doesn’t always offer that, either. Sky, on the other hand, has already committed to Dolby Atmos surround sound and offers that for Premier League football matches. So how can you set yourself up for the best audio experience, no matter how it gets broadcast? As the boy scouts will tell you, be prepared. Many speakers will now recreate virtual surround sound from a simple audio feed. That means no matter the way the game is broadcast you’ll be able to ensure you feel immersed. Another option is to make sure you have plenty of wattage from your system so there’s always the louder-is-better option. Play it safe this World Cup by upgrading to a 5.1 channel surround sound system. That should mean that if we do get surround sound input, you can enjoy a powerful recreation that leaves you feeling immersed. It’ll also offer maximum channels for balanced sound so you can enjoy the commentary as well as the crowd. 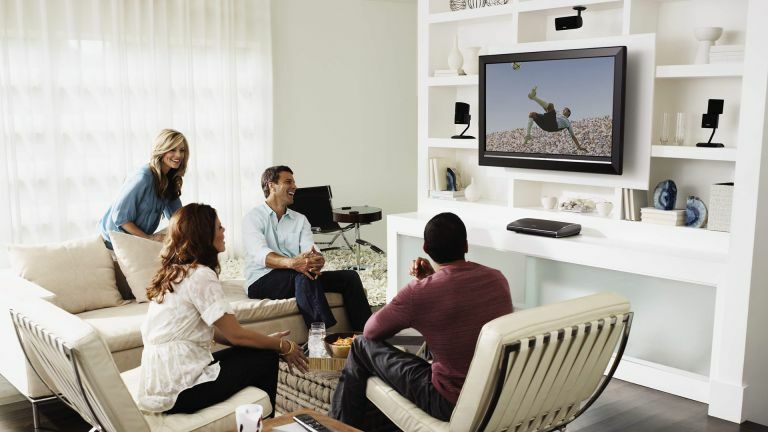 The Sony BDVN7200WB offers a whopping 1200W of power with a rumbling sub that should help turn any room into a virtual stadium for the games. Thanks to Dolby Digital 5.1, ProLogic, TrueHD and Digital Plus you’re covered for lots of codecs – just not Dolby Atmos. But that’s reflected in the £479 price. One way to ensure you get an immersive audio experience, regardless of input, but without filling up your lounge with speakers, is to go for a soundbar. These are compact and can enhance the way a room looks while also enhancing the audio output a TV could manage by itself. If you go high-end, like the Sony HT-ST5000 at £1,199, you get a fully fledged system in a bar and subwoofer combo. This is Dolby Atmos powered and supports DSEE HX to enhance audio sources to near hi-res quality. The result is a soundbar that’ll give you big virtual surround movie experiences when watching Sky long after the World Cup is done, but will also immerse you in the crowds of the games for the 2018 event. Another option is to opt for a device that creates the atmosphere of a surround sound system using the audio input at its disposal. Dolby DTS is a great way to create virtual surround. Since it’s virtual that means you don’t need to go for an elaborate sound system with lots of messy speakers and wires that can be a hassle to setup and east up space. There are more affordable options like the the Samsung HW-N400 for £299 which uses DTS virtual surround sound to create an immersive audio experience. This also features a built-in subwoofer meaning a super minimal design but with enough bass power to create a crowd roar balanced alongside clear commentary. One way to hedge your bets is to go for a Bose SoundTouch 300 soundbar which offers plenty of power and big sound in a compact package. Should you wish to go even more immersive with speakers at the rear of the room also, you can add them in the form of the Bose Acoustimass 300 wireless bass module and Virtually Invisible 300 wireless surround speakers. That way you get enhanced audio power and quality, over your TV, regardless of what audio format UK broadcasters decide to air. Then if there is a 5.1 surround sound options you can enhance and adapt as you need to.